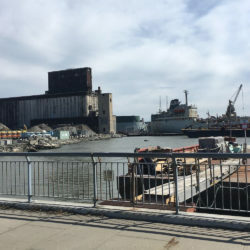 A Department of City Planning presentation on the Gowanus Draft Zoning Proposal unfolded like a “science fair,” with no opportunity for community feedback — so attendees took matters into their own hands. Inside the gathering at P.S. 32 on Hoyt Street on Wednesday night, blown-up pages from the draft proposal released to the public last week were hung around the gymnasium. Employees of the DCP, which sponsored the event, mingled with the crowd, engaging with them in conversation, Brownstoner reported. The crowd, however, indignant over the lack of a question-and-answer style forum, broke off from the group and staged their own meeting-within-a-meeting, according to reports. The next meeting is scheduled for Feb. 28, when the DCP will present their plan to Community Board 6 at their next land-use meeting. The meeting’s location is still TBD — and those who are unable to attend can contact the team with ideas, questions and comments at [email protected]. Sign up for the project mailing list to receive updates on future events and meetings. One local resident tweeted during the meeting that “the city attempted to turn it into a science fair-style open house,” community site Pardon Me for Asking reported. As the Brooklyn Eagle reported last week, the new Gowanus zoning proposal will have to get the City Council’s approval as part of the ULURP process, and would earmark Fourth Avenue for mixed-use development, including high-rise construction; designate two small areas for residential only; designate several areas to the west of Fourth Avenue as industrial and commercial; and more. Members of the Gowanus Neighborhood Coalition for Justice, led by Karen Blondel, a NYCHA resident who is active with the Fifth Avenue Committee, demanded a “real meeting” and began one in a corner of the room, according to Brownstoner. NYCHA residents chanted, “The Gowanus Plan is incomplete; City Hall take a seat,” and “Before you rezone, fix our homes,” Pardon Me for Asking said. In a statement, the coalition asked that local public housing be preserved, that the city require “deepest affordable” units as part of the planned Mandatory Inclusionary Housing, that 100 percent affordability be mandated on any development built on city-owned land and that an “EcoDistrict” be created, Brownstoner reported.